There are a few key things that keep PC gamers tethered to their desks, one of them being the awesomeness of having the "click clack" of a quality mechanical keyboard punctuate their gameplay. Impressive as they may be, laptops haven't been able to replicate that experience...yet. MSI to the rescue! 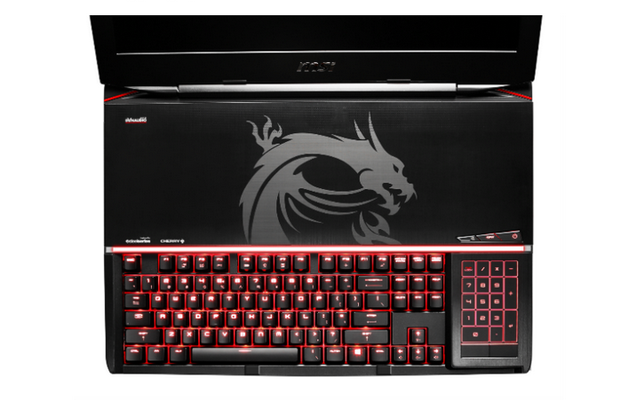 Today the hardware developer unveiled its latest in a long, long line of spiffy gaming laptops: the GT80 Titan. This one stands out from the pack because, as a representative for the company proudly stated in an email to Kotaku, it's "the world's first gaming laptop with a mechanical keyboard." It's an 18-inch machine with a clicky keyboard made by prolific peripheral producer SteelSeries built in. The company's press release didn't give a full rundown of the GT80's hardware specifications, but it noted a few details that might stand out to the hardware buffs out there. The keyboard "uses standard Cherry switches and a standard keycap with 27mm of thickness, nearly five times of traditional laptop keyboards". They also claim that it's "the world's slimmest and lightest 18-inch gaming laptop, measuring 17% thinner and 22% lighter than its closest competitor." It promises that the new device "blends the performance of a high-end gaming desktop with the mobility of a laptop." We'll see if that's actually the case once we get our hands on the thing. But regardless of the specifics of this particular piece of hardware, I have to admit that I'm thrilled by the simple fact that someone's trying to make something like this in the first place. I recently finished rebuilding my very old gaming PC from the ground up and got my first mechanical keyboard to go along with the new rig, and...what's that expression: "I once was blind, and now I see?" Playing games just feels better when your every movement is registered with a resounding "clack". I'd go as far as saying that this kind of haptic feedback is more important than having the best CPU or graphics card on the market. Bringing that kind of experience to a mobile device makes me much more interested in gaming on a laptop as a result.